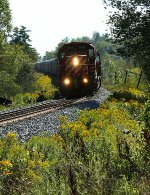 Title: CP 2-441 at Mile 108 Galt Sub. Description: CP 5996 trails on the pickup at London. Description: CP 8248 - 8249 and 5996 lead the pickup east out of London. Description: CP 5996 and STL&H 5560 run light into Sudbury yard. Description: CP T69 led by CP 5996 and CP 5981 heads east out of Nissouri after meeting 441. Description: The London Pickup heads east at Zorra.